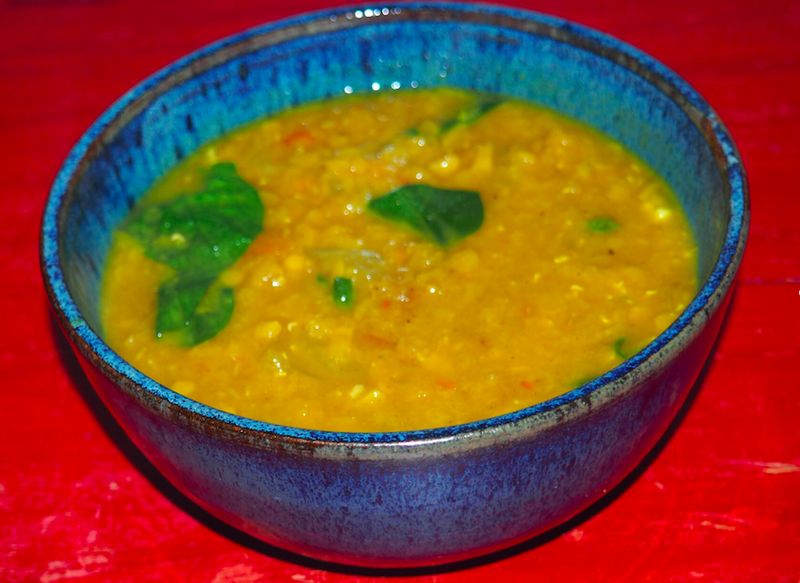 This satisfying Indian soup is delicious, super healthy, and very easy on the planet. It makes a great side dish, and if you serve it with a salad and rice or naan, it can be the main dish. Beans and lentils have an especially low carbon footprint when compared to other high protein foods, partly because they are plants, and partly because their roots support microbes that can draw nitrogen from the atmosphere and change it to a form that is usable by plants! This saves a lot of greenhouse gas emissions, because making nitrogen–rich fertilizer requires a great deal of energy. Once you get into the routine of making it, this soup is actually quite quick to whip up. You’ll see many of the ingredients are listed as optional, so don’t be afraid to try this even without the particular spices. 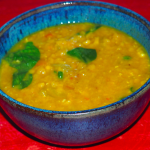 Red lentils taste great cooked up with just salt and garlic, so you really can’t go wrong! Wash the lentils thoroughly. For the first few rinses, the water will be very cloudy. Keep rinsing until the rinse water is fairly clear. 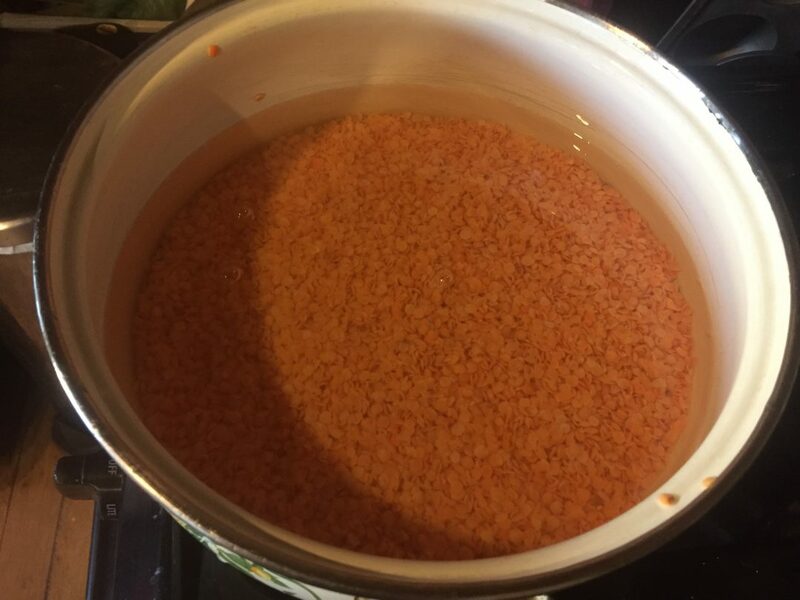 Put the rinsed lentils in a saucepan with 5 cups of water. Start with the heat on high. Add the rest of the ingredients, through the tomatoes. When you reach a boil, turn the heat down and simmer uncovered. Add the spinach when the lentils start to get soft. You’ll know it’s done when it’s a nice consistency and the lentils are still distinct, but soft. If you cook it too long the mixture will get pasty. Squeeze in some lemon juice at the end. Variation: Instead of the tomatoes and onions, you can add a cup of chopped cauliflower and a chopped carrot. You can also leave out the garlic and ginger. Each of the 8 servings has 212 calories and results in just 71 g CO2-eq. Compare this to a beef chili, which for a serving with the same calories results in a massive 3,024 g CO2-eq. Switching just one meal one time from the beef chili to the dahl saves the amount of gas required to drive 13 miles in a 40 MPG car (per serving)! 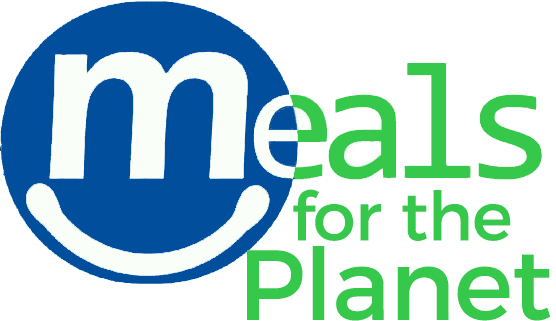 This really adds up—if every day you made a similar shift for one meal per day for a year, you would save the gas used to drive the same car 4,850 miles! And while the protein in the dahl is somewhat less than in the beef chili (14 g versus 25 g), the iron is actually higher in the dahl (4.1 mg versus 2.7 mg), as are the fiber (15 g versus 1 g), vitamin A (850 mg versus 9 mg), and calcium (41 versus 28 mg). The credit for this recipe goes to Nisha and Anand Patel, two of the very best chefs I have ever met! I would recommend also toasting the turmeric, cayenne, garam masala spices in hot oil for a minute to get them to develop and open up. 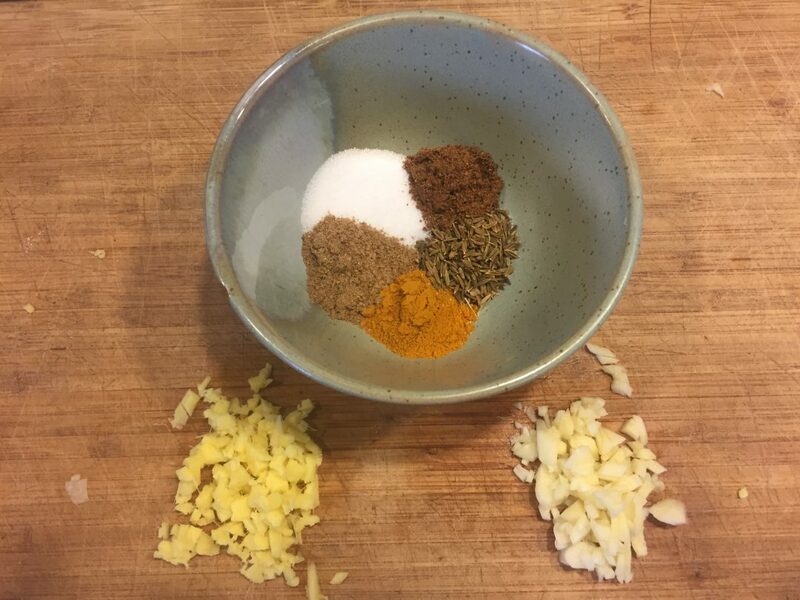 I do it for many recipes and can really bring out the flavor of the spices in a soup or sauce. You would start the recipe with toasting the spices and then add all the wet stuff. I’m excited about this new venture, I cook a lot now and its a huge hobby of mine. Absolutely delicious! I am so excited to try this on my own- thanks for the sample and the recipe!